Influences of Magnetostriction and Magnetisation State on Strain and Force Measurement with Eddy-Current Sensors Applied to Steel Reinforced Concrete. Bridge constructions of steel reinforced concrete elements are subject to material fatigue. They are exposed to different environmental conditions and dynamical load changes. For a better quality surveillance of these construction parts optimised eddy-current sensors can help to recognise damages earlier and to reduce rehabilitation expenses. Stress has a significant affect on the magnetisation of ferromagnetic materials. Magnetic monitoring can be exploited to detect anomalous or changing stress concentration in high performance steel structures. It is now clear that stress causes both reversible and irreversible changes in magnetisation, and that these changes are not directly related to magnetostriction . However, this work points out that there is a perceivable connection between magnetostriction, stress and material permeability in constructional steel . The aim is to measure the coil impedance of an eddy-current sensor positioned close to a prestressing cable surface and to deduce the change of stress in steel reinforced concrete elements. Measurements were taken with specified specimen to investigate diverse influences. Principal influencing components of the eddy-current force and strain measurement method are residual stress and magnetisation, magnetostriction, temperature and geometrical conditions. Different classes of steel can be produced by variation of additive materials as carbon, vanadium, chrome, manganese, phosphorus or silicon etc. Each custom-made steel grade inheres residual stress into its structure and also a certain level of magnetisation. As a result of structure changes due to production and admixture, any kind of steel already has a pre-defined complex impedance Z. Furthermore, this impedance is highly temperature dependent . Due to these facts the precision and the reproducibility of the measurement are clearly restricted. The sensitivity of an eddy-current sensor on force and strain in a ferromagnetic steel bar is normally lower than geometrical and environmental influences. Therefore, the effects of geometrical size, material structure of the specimen and the environmental temperature (resp. sensor self-heating) have to be compensated [3,4]. Additionally, it is essential to calibrate the sensors before measuring. For the analysis of structure and residual stress conditions in steel, focussing on the magnetic material constant known as permeability, optimisation plays a very important role. Under variation of tensile stress on a steel bar, the relative permeability changes. Thus, the inductance Ls of the sensor coil close to a steel bar specimen depends directly on the steel permeability. The magneto-elastic effect produces with a certain level of applied stress on the steel bar a change of the coil's inductance. While tensile stress is applied to the steel bar the inductance of the sensor coil in tensile direction can increase but positioned in cross-section the inductance decreases and the converse [5,6]. The principle of the experimental construction is suggested in fig.1. While a coil is wound up on a ferrite core and put on a steel bar, the steel is loaded with tensile stress. It has to be made certain that the ferrite core rests without air gaps close to the bar. Since the magnetic circuit is now closed by the iron, impedance variations can be measured during the influences of mechanical stress, see fig.1. Fig 1: Coil and ferrite core coupled to a steel bar. The pre-stressing on the material takes place in the elastic area. Comparatively two different materials have been investigated. For a principle examination of the experiment, a soft steel (St37) with 6mm square profile and a maximum tensile strength of 370 MPa has been observed first. The choice of a square profile reduces the air gap between the ferrite core and the steel bar consequently and also undesirable geometrical effects on the measuring results. After this, a steel bar of the quality St1860 (1860MPa), which is originally used as pre-stressing for reinforced concrete, was loaded in a comparable stress range referred to its yield strength. By means of an impedance analyser HP 4284A and a reference load cell (measuring range 25 kN) several consecutive measurements cycles on each of the two materials have been taken which showed comparable load cycles. 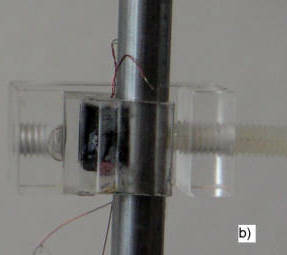 The specimen were put on a tie rod pre-stressing device in a manner as seen in fig. 2a,2b. 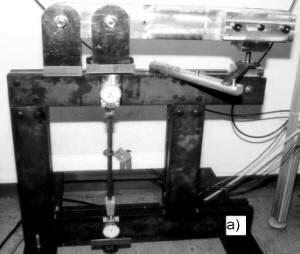 Fig 2: a) Clamping jig with fixed specimen b) Zoom of St1860 specimen and fixed sensor. The sensor inductivity curves measured on soft steel (St 37) clearly show a climbing tendency of DLs by an increase of tensile stress. Remarkable is a small hysteresis between the starting and end points of the load and unload cycle. In contrast to warm-rolled steel (St 37) cold-drawn steel (St 1860) behaves in a different manner. Measurements on this tempered steel have shown that inductance and resistance behave retrograde applying tensile stress. This effect can be attributed to plastic deformation due to the cold-drawing process as well as to the different percentage of solved carbon in the lattice. If metals are deformed plastically, their solidity increases. The rise of solidity is dependent on the deformation speed, and also from the affinity of the used material to strain hardening. For both mentioned steel qualities different operating points have been investigated with regard to frequency and excitation. The measurements resulted that the excitation frequency for the given eddy-current sensor ranged between 600 and 800Hz with an approximatly amperage of 30mA, see fig. 3a. The reason for this effect can be attributed to the operating point of the steel permeability. The magnetic conductivities of the steels depend both on the field strength H and on the exciting frequency, see fig. 3b. Fig 3: a) Sensor operation point diagram b)Permeability of St 37 and St1860. For this reason, the following stress measurements have been taken under an excitation of I= 30 mA and a frequency of f = 600 Hz, see fig. 4 and 5. Arrows indicate the increase and decrease load curves of both materials. Fig 4: Inductance curve measured on a 5.3mm round steel bar, basic material: St1860 (DIN 10128). Fig 5: Inductance curve measured on 6x6mm square bar steel, basic material : St37 ( DIN 17100). Concerning the cold-drawn steel (St1860), the inductance Ls decrease with increasing strain almost proportionally. The non-linearity of the inductance characteristic Ls1 (s = 0), Ls2(s = 0) during the load is smaller than 1 % change related to the inductance modification. The hysteresis in fact is likewise small but indicates nevertheless a change of the magnetic state of the material. At the macroscopic scale two different phenomena illustrate the couplings between the elastic and magnetic behaviours of ferromagnetic materials: first, magnetisation induces a deformation mechanism called magnetostriction, and second, stresses have an effect on the magnetic behaviour. The complexity of the non-linear relations between these phenomena is such that few realistic macroscopic constitutive equations have been proposed like (3) to model the coupled magneto-elastic behaviour of magnetic materials [7,8]. The saturation magnetostriction value ls in steel is dependent on crystal orientation. In cube edge direction [100-orientation] the magnetostriction of FeSi iron (e.g.) is positive. But in the diagonal intersection [ 110 ] the magnetostriction changes its sign. This anisotropy depends among other things on the orientation of the crystallites in the steel structure. Parallel to other magnetic characteristic values the steel specimen magnetostrictions l have been determined. The measurements were implemented at stripe shaped steel samples with strain gauges. Two gauges were glued in magnetisation direction on top and bottom of each sample. Afterwards the three probes (a St 37, St1860 and a nickel) with a dimension of 20mm x 5mm x 2mm have been researched on magnetostriction. Whereas the nickel test specimen served to calibrate the measurement device. So, it was possible to determine a length variation l while applying an external B - field up to 1 Tesla. Fig.6 shows the magnetostriction measurement arrangement. During the magnetising of soft steel St 37 the material expands in field direction first. When the field strength reaches a certain level, the magnetostricton coefficient decreases and turns into a negative value at higher field strength (see fig.7). The more compressive stress is present in steel the more energy is needed to magnetise. Before the material extends the compression stress deformation must be compensated whereby the amplitude of magnetostiction (relative length variation) increases. Consequently the saturation magneto-striction value ls is less pronounced without applied compression or applied tensile stress. Fig 6: Scheme of the magnetostriction l measurement arrangement. Fig 7: Magnetostriction l curves of Steel 1860, St 37 compared to Nickel 99,9999%. If the material does not have a prefered orientation, one can determine the process of the resulting magnetostriction for instance by addition of the curves of the three space directions. If a certain orientation gets more frequent at expense of an other, the magnetostriction value changes accordingly. Comparing the two steel inductivity courses in fig. 4 and 5 to the magnetostriction progression as shown in fig.7 it is observable that with an increasing coefficient of l the inductivity increases, too. If the magnetostriction l declines, DL/L declines in the same way, see also fig 8. Fig 8: Eddy-current sensor inductivity change of steel St37 on different bias magnetisations (BDC means a relative value of the flux density inside the steel bar, approx. 50 mT). Although the measurement results can not easily transfered to the behavior of the inner core material because of the eddy current effect. Referring to the different magnetostriction results, a reason for the behavior of the sensor inductance rise under applied stress is obviously. Further examinations have shown that a bias magnetisation of the steel specimen can change the sensor inductivity rise DL/L, see fig. 8. This measurement indicates that the curve shape of the magnetostriction coefficient is in direct connection with the inductance gradient. The St37 steel reacts in exactly the same way to external magnetic fields, as well as on tensile stress. In both cases the permeability gets smaller and thus the sensor's inductance. Additional measurements are in progress to specify the exact relationship between the relative inductivity change and stress on various bias magnetisations (flux density). This can be useful concerning a calibration of the sensor. If the magnetostriction gradient is known in the specified load range, then a pre-setting of the inductance rise can be made. In pre-stressed concrete construction, wires and strand-bundles are often used as reinforcements. In relation to measurements of single rods or single wires strands and strand bundles additional problems raise according to geometrical form variety. It has to be noted that always all wires of strand bundles do not exhibit the same stress during load changes (change of the total tendon strength). It is necessary to position a sensors on every single rod of a strand to increase the accuracy of the measurement. The developed eddy-current sensors could be used not only for force and stress measurement of tensile steel elements and for the monitoring of pre-stressed bridge cables but also for the measurement of residual stress components. The eddy-current method is an available technique for non-destructive testing to measure force and stress, resp. residual stress in existing structures with ferro-magnetic structural elements. A basic measurement principle involves the measurement of the M-H relationship to obtain the magnetic permeability, which is stress dependent. The basic sensor design is very simple involving a ferrite core with two small coils. The permeabilty versus stress relationship is typically non linear. A linearisation is possible by suitable selection of bias magnetisation. Influencing factors should have been optimised before measuring mechanical stress in steel with knowledge of magnetostriction gradients. The aim of this optimisation is also to reach first, a maximum impedance variation DZ of the mounted sensor for a desired frequency range, second, to make sure that an adequate linearity and reproduceble rise of the measurement value is given. This work was promoted by the Deutsche Forschungsgemeinschaft (DFG). The authors would like to thank the DFG for the financial support. They also owe sincere thanks to Dr. W. Zinn, Institute of Material Technology of the University Kassel, well as Dr. G. Dobmann, Fraunhofer-Institute for Non-Destructive Testing, and Dipl.-Ing. A. Jahn from the Company "Kölner Drahtwerke" for their support. D.L. Atherton, L.W. Coathup, D.C. Jiles, L. Longo, C. Welbourn and A. Teitsma. (July 1983) "Stress Induced Magnetisation Changes of Steel Pipes - Laboratory Tests", IEEE Trans. on Magnetics, Vol. MAG-19, No. 4, 1564-1568. W. Ricken, W.-J. Becker, H. C. Schönekess: Mechanical Stress Measurement with Magnetic Sensors, Sensors 2003, in Proceedings Vol. I, 59-63, Nürnberg, 2003. J.-G. Liu, T. Gerhold, W. Ricken, W.-J. Becker, E. Fehling: Einfluss der magnetischen Kopplung bei der Vorspannungsmessung an Spannstahl. Jahrestagung DGZfP, 29.-31.Mai 2000, Innsbruck, p. 959-968. W.-J. Becker, J.-G. Liu: Eddy-current sensors and applications on force and stress measurements. Tunesian-German Conference on Smart Systems and Devices, 27-30 march 2001, Hammamet, Tunesia, Proceedings, p. 197-202. W. Göpel, J. Hesse, J. N. Zemel, (Ed. ): Sensors, Vol. 5 Magnetic Sensors, VHC,Weinheim, 1989, p.97-152. D. Jiles: Introduction to Magnetism and Magnetic Materials. Chapman and Hall, London, 1991. C. Gourdin, L. Hirsinger, G. Barbier, R. Billardon, Experimental identification of the coupling between the anhysteretic magnetic and magnetostrictive behaviours, International Conference on Magnetism, 1997.